Boca Raton has seen a rash of development in its downtown and there is more to come. Developers frequently cite the increase in taxes that will occur when development is completed as a major reason for the City to approve their plans. The unspoken implication is that the new development will lower your taxes. It won’t! Why? 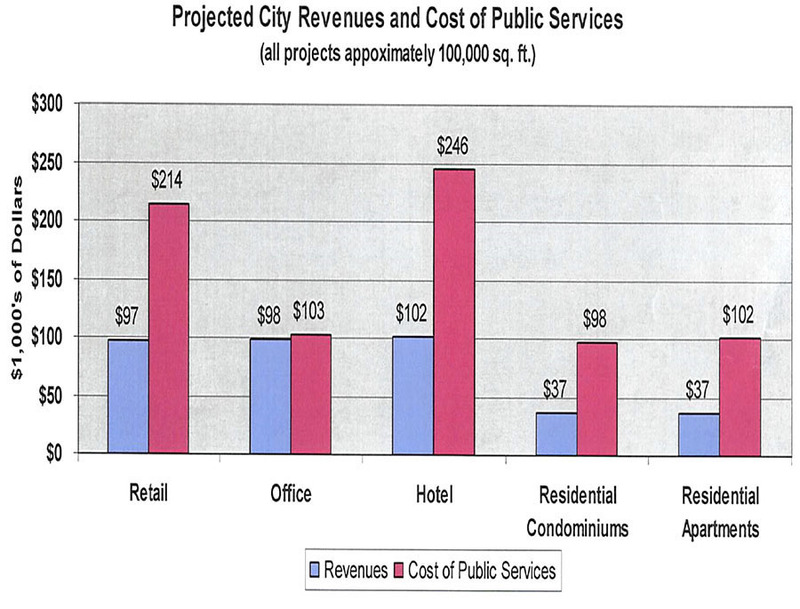 City operating costs will increase by more than City revenue produced by the new development. Where do the revenues go? 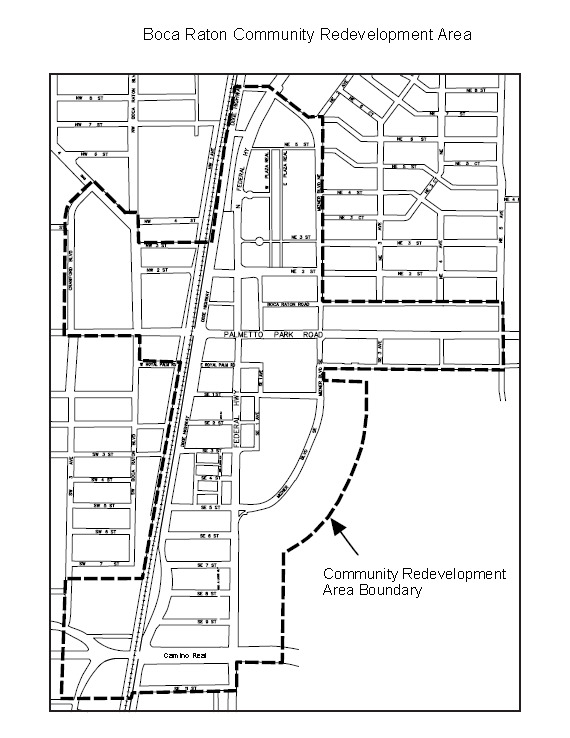 Downtown Boca Raton is a Community Redevelopment Area (CRA). See Figure 1 for the boundaries of the Area. Revenue increases that result from development in the CRA go to finance public activities needed to allow revitalization of the Downtown. Other public entities like the City and County receive limited revenue from the development of the downtown. Indeed, a 2010 report by staff (hyperlink Figure 2 to “report by staff”) to the CRA indicated that all types of development in the downtown would result in costs that exceed revenue gains to the City. For example, 100,000 sq ft of apartment development will cost the city $102,000 and will produce only $37,000 in revenue. The implication is that the City will have to find additional revenue, most likely through tax increases, to pay the added cost for City services for new Downtown developments. This development has approximately 460,000 square feet. Using the City staff data above, the project will cost the city approximately $300,000 more each year than it will bring in in revenue. Your taxes are likely to go up not down as a result of the new development in the Downtown! The Downtown will have more TIF revenue to pay off loans for previous infrastructure improvements and other costs and will have new monies to make further improvement in the Downtown. The City, the County and other taxing entities will have additional costs that exceed the additional revenue they receive as a result of Downtown development. You the taxpayer are the most likely source of the added revenue the City and other taxing jurisdictions will need! Boca Raton, Via Mizner, the first of three mammoth new buildings in downtown Boca.November 15, 2015. In a recent article, the Sun Sentinel explored the pros and cons of Boca’s “new look.” Numerous members of the City Council were interviewed, as were various development advocates, but although the headline touted “citizen concerns,” not one ordinary citizen or citizens’ group such as Boca Watch or BocaBeautiful.org was quoted. Nor was there a single word about traffic. Not one word. A $50,000 “traffic study” by Boca’s City Council has focused on the problems with one intersection, at Fifth and Palmetto, site of the enormously popular Trattoria Romana and the enormously controversial Wildflower development. We learned that in preparation for its conclusions, the well-paid consultants counted cars in the month of September, which is like recording snowfall in July. A similar study of the gridlocked intersection at 5th Avenue and Federal Highway was conducted when the main destination there (Florida’s largest Publix) was closed for renovation. Even if they come up with a brilliant solution for Fifth and Palmetto, that will fix only a tiny piece of the problem. The root of Boca’s coming traffic congestion crisis is this: too many residential and commercial units are being crammed into the one square mile “downtown” where there are only five main roads. The new plans for Royal Palm Place alone call for a 3000 car garage. If all the apartments, offices, retail establishments and hotels are completed, we estimate that there will be an additional ten thousand cars in and around the downtown area by 2018. And that’s just the people who live and work and want to park there. The developers and their allies tell us that the infrastructure studies done over 20 years ago anticipated all of this, and that we have nothing to worry about. If you are experiencing slower commutes on Glades, Dixie, Federal, Palmetto or Camino, it is not because of the new residents of the downtown (they haven’t arrived yet), but because of the increased traffic caused by people passing through Boca. That’s people travelling from Delray to Pompano or Deerfield and back. Their solution? Maybe we need to build a bypass around Boca’s downtown! The Boca Beltway! You’ll also hear lots of talk about how we don’t need to worry about cars because we are building a “pedestrian friendly” downtown. The assumption that people are joyously going to walk everywhere ignores both Boca’s demographics and the laws of human behavior. If everyone’s going to be on foot, why are the developers building all all those parking spaces? To be used as auto storage units? Are people going to travel to and from the grocery store on trolleys or segways? And what about the people who come from out of the area to service all of our new downtown residents? Or the visitors who come and stay in all the new hotels? Perhaps downtown Boca will become the aerobic capital of the world. Let’s pause new construction in the downtown—especially the massive Via Mizner Phases II and III—until we have done an area-wide traffic study, counting traffic in peak periods like February, and come up with a comprehensive plan to cope with the cars of the additional residents, commuters and tourists who will flock to Boca’s new urban mecca. Let’s put the horse before the cart for a change, or more specifically, lets make sure we have the roads before the cars arrive. That’s what the Boca development debate should be all about. Not the paint job on the Mark or the number of Mizner turrets a developer can put on a concrete pile. Developers have been exploiting Boca’s Interim Design Guidelines (IDG) to achieve higher density development and clog Boca’s downtown. The IDG allows downtown buildings to rise 60% higher than the traditional Development Ordinance (to 160 feet rather than 100 feet). Further, developers have exploited the complexity of the IDG and loopholes in its Guidelines to increase density (square feet of development per square foot of land) as well as height. Now the City is considering adopting the Pattern Book which would extend the 60% increase in height to the entire Downtown! In contrast to Boca’s standard Development Ordinance (Ordinance 4035), the IDG and the Pattern Book require complicated quantitative and qualitative assessments of any development plans. According to City Staff, these assessments are so technical that they are subcontracted to a private firm, Urban Design Associates (UDA), the firm that worked with the City to develop the IDG and its sibling, the Pattern Book. The City is presently considering adopting the Pattern Book in the near future. UDA, the private firm that developed both the IDG and the Pattern Book has no offices near Boca Raton; however, it decides whether or not a development project is in agreement with their guidelines and recommends approval or disapproval. Not having the capability to perform the necessary assessments themselves, our City staff’s role has been reduced to rubber stamping UDA’s approval recommendations. If UDA’s Pattern Book were adopted by the City Council, the current arrangement with this private firm under the IDG would become permanent, as only they would be capable of assessing development projects and determining whether or not they are in compliance with the complex development regulation they have developed. This is not a healthy situation for our City, but is a very advantageous one for UDA’s bottom line. Look around at what is coming out of the ground in “downtown” Boca. Do you think that Urban Design Associates is doing a good job designing our downtown? Should a private firm have such major influence on our City’s development? Next time you are driving, walking or jogging through “downtown” Boca, take a look. New construction is everywhere—from Camino Real to Palmetto Park Road. Not only are these new projects BIG, but most of them exceed Boca’s historic 100-foot height ordinance. As a result, by exception, the village of Boca Raton is being transformed right before our eyes. And the results are far from exceptional. IT IS TIME FOR THE RESIDENTS OF BOCA TO TELL OUR CITY COUNCIL, OUR CITY “PLANNERS” AND OUR CITY MANAGER THAT ENOUGH IS ENOUGH. IT’S TIME FOR A PAUSE IN BOCA’S BUILDING BINGE. We are not anti-development. We are in favor of development that comports with Boca’s downtown master plan and history. We do not want the condo canyons of West Palm Beach or Ft. Lauderdale here. We are BocaBeautiful.org, a volunteer organization, endorsed by Bocawatch and Build a Better Boca, whose purpose is to inform and educate regarding issues of importance to the citizens of Boca Raton. If you share our concerns about out of control high rise development in downtown Boca-- and all that it will bring-- join us. 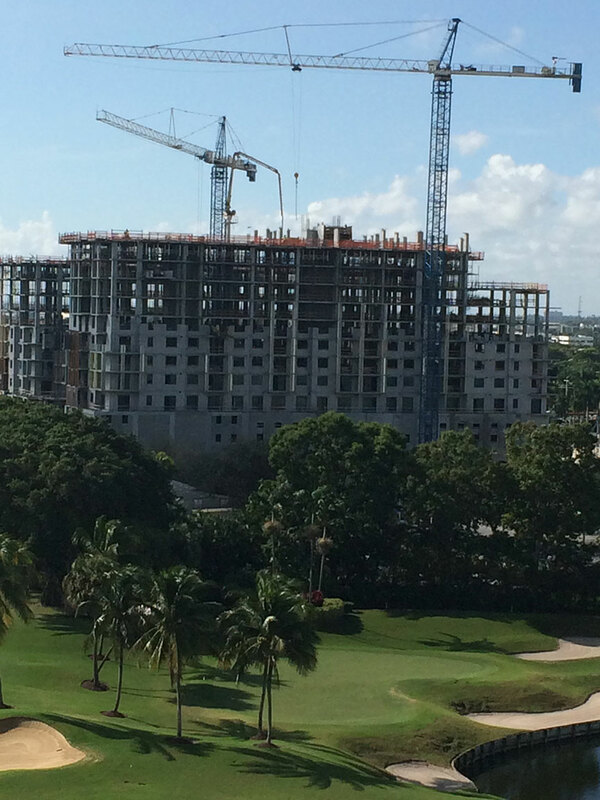 THERE ARE MORE THAN ENOUGH 10+ STORY BUILDINGS ALREADY UNDER CONSTRUCTION IN DOWNTOWN BOCA. WE DO NOT NEED ANY MORE. HELP US MAKE THAT POINT. Download our registration form to join Bocabeautiful.org and make a donation toward preserving a more beautiful Boca! BocaBeautiful.org is a non-profit corporation that supports development consistent with Boca’s history and architectural heritage. BocaBeautiful.org is a non-profit volunteer organization committed to preserving the beauty and the historic architectural values of our city. Since its inception in the 1920s, Boca has always been a planned community, governed by a master plan and strict building codes. Now that plan and those codes are at risk. Since 2008, your City Council has approved ordinances that have allowed builders to exceed Boca’s historic 100-foot building height limit in the “downtown” area. The first exception to the traditional construction rules, The Mark, is nearing completion and is mammoth. Construction has begun on the massive (three football fields long) Archstone Project on Palmetto Park Road. A 14-story box is rising at the corner of Camino Real and South Federal Highway, the first of three phases of construction on that block. Construction is about to begin on Tower 155, a 12-story building on a very small lot on North Mizner Boulevard. Several more 100+ foot buildings are in the works. If they are approved, say good bye to Royal Palm Plaza and Mizner on the Green as we know them. Say good bye to downtown Boca as Addison Mizner envisioned it.The next time you are walking or riding in downtown Boca, take a look around. Are you happy with what you see? How’s the traffic? How’s the parking? How are the views? Those of us who support BocaBeautiful.org think it’s time to tell our city officials, elected and non-elected, that “enough is enough.” We chose to live in the low-rise village of Boca Raton, not the condo canyons of Aventura, Ft. Lauderdale or West Palm Beach. We are not opposed to development. We are opposed to a process that seems to be rigged in favor of the developers-- a process under which it is possible to have building after building project approved by exception, and where the results are anything but exceptional. We are opposed to the abandonment of Boca’s historic height and density requirements because we have seen the result. If you agree, please support us in our mission to educate the public. We need to convince our city officials to call a halt to the current building binge, to carefully measure the impact of what has been approved in the last five years, and to come up with a plan going forward that will preserve the beauty and historic values of the Boca Raton we all love.